Procedure codes represent the services that you render and products that you sell. You can delete custom procedure codes that are not attached to any appointments and have not been posted to or charted (as existing, treatment-planned, or complete) in patients' records. Alternatively, you can inactivate a procedure code so that it is not available for selection wherever procedure codes can be selected. Important: If you delete a procedure code that is part of any multi-codes, that procedure code will be removed from those multi-codes, and any of those multi-codes that are for bridges will be inactivated. However, if deleting the procedure code results in any multi-codes not having any associated procedure codes, those multi-codes will also be deleted. On the Settings menu, under Production, click (or tap) Procedure Codes & Conditions. The Procedure Codes & Conditions page opens. On the Procedure Codes tab of a location's Procedure Codes & Conditions page, select a procedure code. To quickly locate a procedure, type a code or description in the Search for specific procedure box near the top of the page. 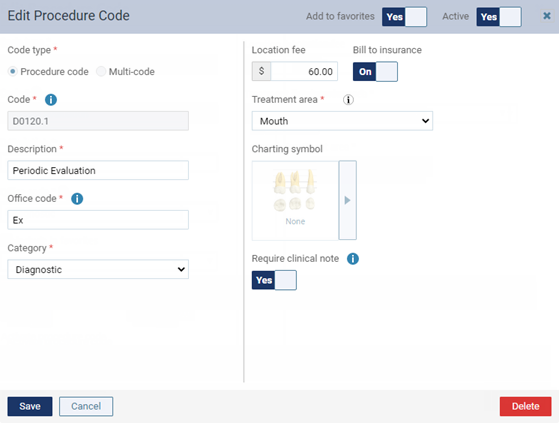 To filter the list of procedure codes, in the View list, select whether you want to view all procedures, only the favorites (most commonly used procedures), only active procedures, or only inactive procedures. The Edit Procedure Code dialog box appears. Click (or tap) Delete. This button is available only if this is a custom procedure (not a standard ADA Procedure Code) that has not been charted (as existing, treatment planned, or complete), posted, or scheduled for any patient. Can I delete procedure codes that I never use?